Four authors from four different languages in the Northeast have been conferred Sahitya Akademi Awards 2018. Sahitya Akademi announced the annual Sahitya Akademi Awards in 24 languages on Wednesday. Seven books of poetry, six of novels, six of short stories, three of literary criticism and two of essays have won the Sahitya Akademi Awards 2018. While Assamese poet Sananta Tanti has been conferred the award for his collection of poems ‘Kailoir Dinto Amar Hobo’, Bodo writer Rituraj Basumatary has been conferred the award for his collection of short stories ‘Dwngse Lama’ and Loknath Upadhyay Chapagain from Assam’s Digboi in Tinsukia district has won the award for his short story collection ‘Kino Royeu Upamaa’ written in Nepali language. Manipur’s Budhichandra Heisnamba won the award for his collection of short stories ‘Ngamkheigee Wangmada’ written in Manipuri language. Tanti was born in a tea garden family at Kalinagar Tea Estate in Assam’s Karimganj district in 1952. The well-known poet retired as Deputy Provident Fund Commissioner at Assam Tea Employee PF Organisation. Earlier, Tanti received the Assam Valley Literary Award. The poet, who is suffering from cancer, is currently undergoing treatment at Indraprastha Apollo Hospital in New Delhi. Bodo writer Rituraj Basumatary hails from Langhin in Dokmoka area of Karbi Anglong district of Assam. Earlier, he won Someswari Brahma Literary Award 2016, instituted by the Bodo Sahitya Sabha for his short story collection ‘Dwngse Lama’. He was felicitated by various social organisations on Wednesday at Langhin in Karbi Anglong for being honoured with the Sahitya Akademi Award. The organisations which felicitated him include All Bodo Employees Federation, Karbi Anglong; All Bodo Women Welfare Federation, Karbi Anglong; Dularai Bodo Harimu Afat, Karbi Anglong and Bodo Sahitya Sabha, Karbi Anglong. Loknath Upadhyay Chapagain currently resides in Siliguri. 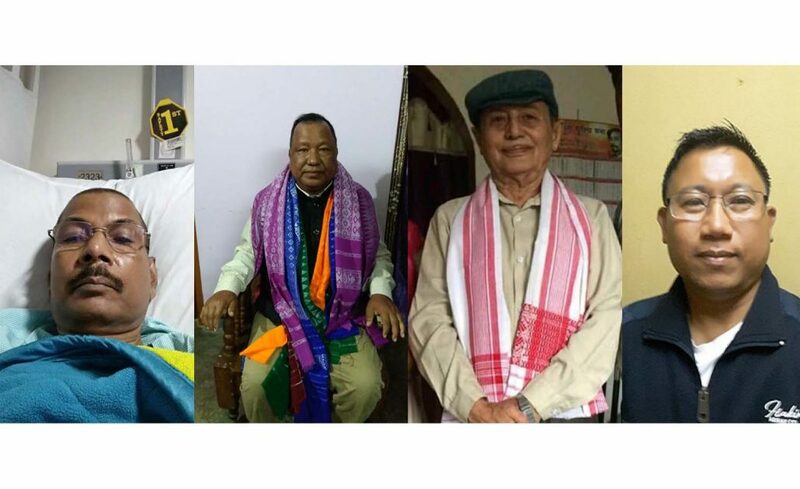 Budhichandra Heisnamba, who originally hails from Komlakhong Mayai Leikai, is currently a resident of Sagolband Moirang Hanuba Leirak in Imphal West district. Born on May 1,1973, Heisnamba teaches history at Thambal Marik College, Oinam in Bishnupur district. The jury members for recommendation of names of the awardees for Assamese language were Atanu Bhattacharyaa, Dr Dipti Phukan Patgiri and Dr Paramananda Rajbongshi while the jury members for Bodo language were Aurobindo Uzir and Dr Bhupen Narzaree. The jury members for Assamese language were Dilip Mayengbam, Prof Elangbam Dinamani Singh and L. Upendro Sharma. The Awards relate to books first published during the five years immediately preceding the year of Award (i.e. between January 1, 2012 and December 31, 2016). The Award in the form of a casket containing an engraved copper-plaque, a shawl and a cheque of Rs. 1,00,000/- will be presented to the authors of these books at a special function to be held on January 29, 2019 at New Delhi during the Festival of Letters organized by Sahitya Akademi.